At 3.10am the big guns began to fire and at that moment the first of the great mines exploded. Within the following few seconds the Messines – Wytschaete Ridge erupted from right to left as one after another 19 huge mines were detonated, causing an explosion so loud that it could be heard in London. The mines blew vast craters as much as 300 feet in width and 50 -70 feet deep and the devastation caused by the mine explosions plus the tremendous barrage enabled the assaulting companies advancing under the dust cloud to make easiest gains yet experienced by the Australians in the war. General Godley’s II Anzac Corps would be on the right of the offensive in the vicinity of the villages of Wytschaete and Messines and consisted of the British 25th Division on the left, the New Zealanders in the middle (in front of Messines village), and the AIF 3rd Division on the right slope of the ridge and what would be the right flank of the whole operation. 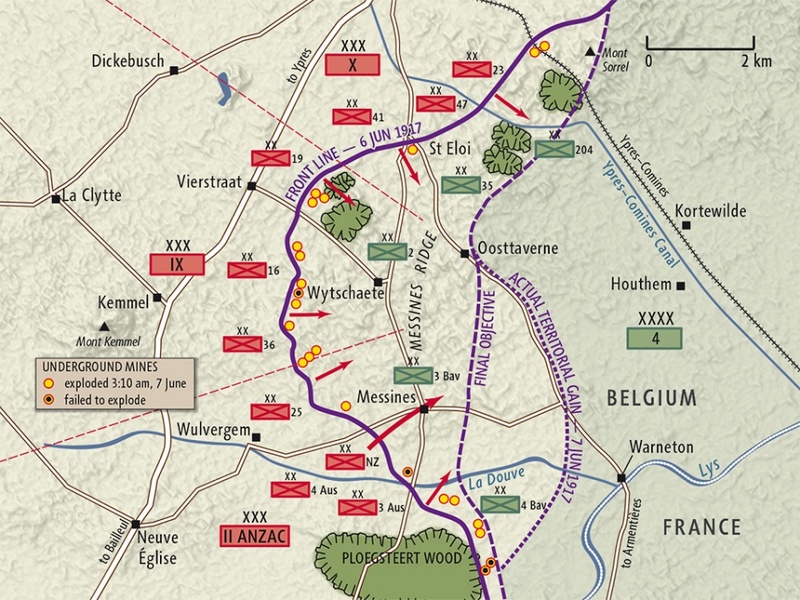 The AIF 4th Division would also be called into action in the second wave pushing through to the second objective, the Oosttaverne Line. This was the first time that the Australians had encountered these ‘pillboxes’ en-masse, a form of defence structure favoured by the Germans in Flanders due to the waterlogged nature of the ground. The taking of these blockhouses often required the infantry attacking from the rear supported by rifle grenadiers keeping the defenders under cover. By sunset the final British objective had been won along practically the whole of the battle-front, and with a speed beyond any other major achievement attained by the British Army in France thus far.